MacArthur simply replied “instant heaven.” Knowing the vagaries of television, MacArthur explained later that he had purposely given a clear and short answer because he knew about sound bites. However, on the following Sunday he chose to further explain to his own flock the biblical reasoning behind his stance. The Bible doesn’t definitively declare one way or another where the unborn, stillborn, babies, and children go when they die. However, there is a cumulative body of scriptural evidence that supports the stance that they do go to heaven. A horrific church massacre that happened in Texas this past Sunday, and several of the killed were children. A one-year-old, 5-year-old, 7-year-old, were among the killed, as well as a woman who was 8-months pregnant, so that unborn child died as well. I believe there were others, though their ages were not listed among the victims’list yet. I thought it would be a good time to raise the issue again. What happens to children who die? But we do not want you to be uninformed, brothers, about those who are asleep, that you may not grieve as others do who have no hope. (1 Thessalonians 4:13). We have hope of Jesus, eternal life, reunion with friends and relatives…and our children. 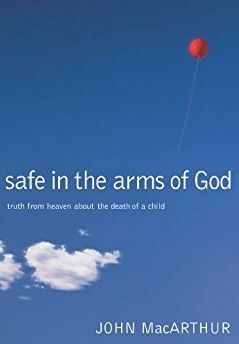 The 2003 book that emerged from MacArthur’s series on the issue is called “Safe in the Arms of God”. Tim Challies reviewed it here, favorably. We mourn when there is a tragedy – of any kind – but “our concerns related to death always seem more profound and heartrending when we are dealing with the death of a child. An accident or illness seems especially tragic and poignant when the life of a little one is lost,” wrote John MacArthur. We know that sin entered the world and death not only came into it but personally touched Adam and Eve, who lost their son. I wrote about that here, in an essay titled after the painter William-Adolphe Bouguereau’s rendition of the moment, called “The First Mourning.” Adam and Eve lost their son to violence, and they wept knowing their sin brought its wages: death. No, Abel was not a youngster, but his loss must have been no less agonizing for the parents. Please take a moment to read it. It’s profound and encouraging. Yet we are called to love. It is our love that is supposed to make us distinct from all others. Hard, I know. I can’t even tread close to the fire of anger and grief in the loss of a loved one. But knowing the child is safe in the arms of God offers a comfort and a mercy that should dissipate the anger and give room to forgiveness. “Lack of forgiveness destroys relationships” said John MacArthur in a recent sermon “Forgiveness in the Age of Rage“. This lack of forgiveness that destroys our relationships includes our relationship with God. Forgiving the one who murdered a child is necessary. Forgiving God who allowed the death of a child is necessary. Our relationships should be characterized by love, forgiveness, charity, and Gospel. The little ones who died in the Sutherland Springs church massacre, and also the Sandy Hook elementary school shooting in 2012 where 20 children were gunned down, and all the other little ones who have died throughout the ages due to illness, war, or abortion, are safe in the arms of God. The book is small and short, but scriptural as to explanations why those who die in the womb, infancy, or young are now safe in the arms of God. You can read it and be comforted or offer it as a comfort to one who is grieving. These essays show from scripture why their authors believe children who die go to heaven. R. Albert Mohler, Jr. and Daniel L. Akin: The Salvation of the ‘Little Ones’: Do Infants who Die Go to Heaven? John Piper: What Happens to Infants Who Die?